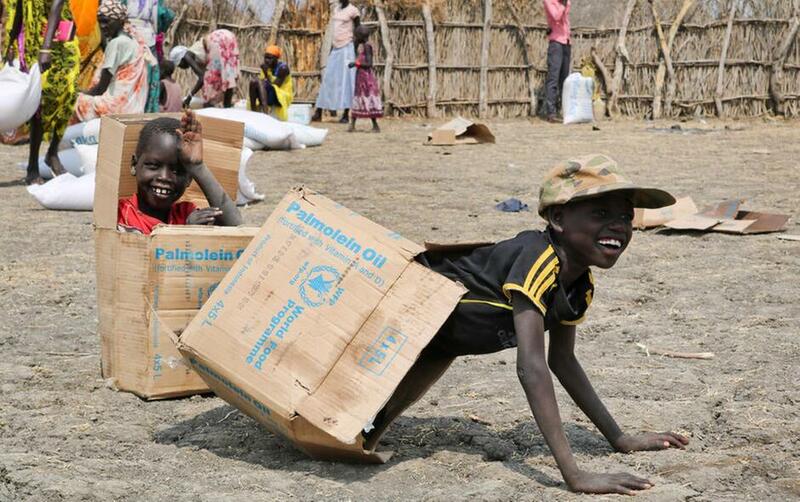 Children play in empty cardboard boxes during a food distribution by Oxfam outside Akobo town, one of the last rebel-held strongholds in South Sudan. Child abductions have risen during South Sudan's civil war as desperate people try to make a living, and one child, no matter the age, is said to sell for 20 cows, worth about $7,000. AKOBO, SOUTH SUDAN (AP) — It's been almost two years since Deng Machar's three young children were abducted from his home and likely sold for cattle. Sitting in South Sudan's opposition-held town of Akobo, the 35-year-old pointed to the dirt beneath his feet. "They were playing right there," Machar said. "It would be easier if they were dead because then I could forget." Machar said his 4-year-old daughter and 5-year-old son were likely sold for cattle after being seized by men from the rival Murle tribe. He doubts his 2-year-old son is still alive. Eleven children in all were abducted from this area that day and none has been seen since. It is a little-acknowledged tragedy in South Sudan's five-year civil war. Child kidnappings between clans have increased as people become more desperate amid widespread hunger and a devastated economy, human rights groups say. "Child abductions and trafficking in South Sudan is a real issue that requires an urgent response by the government," said Edmund Yakani, executive director of the nonprofit Community Empowerment for Progress Organization. The United Nations says its child protection team confirmed abductions in the regions of Unity, Central Equatoria, Jonglei, Upper Nile and Western Equatoria last year, though it didn't have a total number. Although inter-clan fighting, cattle raiding and abductions are deep-seated throughout this East African country, Yakani called it a particular problem in Jonglei state, where the town of Akobo is located and where many in the Murle tribe base "their livelihood" on selling children. During a recent trip to Akobo, near the Ethiopian border, The Associated Press spoke with Murle tribesmen who acknowledged stealing and trafficking children for personal gain. "The intention is to trade the children for cattle or use them personally," said Thiro Akungurouth, a Murle youth leader who knows some of the abductors. One child, no matter what his or her age, can sell for 20 cows, worth about $7,000, he said. Children who aren't sold are kept by families without kids while girls are groomed for marriage, Akungurouth said. Stigma remains against childless families in South Sudan. Abducted girls often are married to their captors. One opposition governor blamed South Sudan's government for the increase in kidnappings, saying it's trying to create a wedge between the Murle and Nuer tribes to advance its military agenda. "It's happening more now because the government is instigating a rift and telling the youth to attack by distributing arms and ammunition," Koang Rambang, the governor of Bieh state, which until last year was part of Jonglei, told the AP. He specifically faulted the country's First Vice President Taban Deng Gai for "instigating more abductions," citing 10 children who were seized in January while Gai toured the largely opposition-held Jonglei. South Sudan's government denied it, saying Gai was in the region only to promote peace. The government also said it had given "directives to the concerned governors of those states to get rid of those activities," said Maal Maker Thiong, who works in the office of the presidency. But as the civil war drives the nation deeper into despair, children continue to be the worst affected. Although South Sudan in 2015 signed onto the Convention on the Rights of the Child, which states that all parties should take appropriate measures "to prevent the abduction of, the sale of or traffic in children," the country's warring factions repeatedly have been accused of committing grave violations against children, including the forced recruitment of child soldiers. "The abduction of children is abhorrent. They are vulnerable and deserve our protection," the chief of the U.N. mission in South Sudan, David Shearer, told the AP. He said the U.N.'s human rights team was due to visit Akobo to assess the situation and advocate with local authorities and armed groups to prevent the practice. Over the years some organizations have tried to work with the tribes, encouraging them to return the kidnapped children and halt the practice. Last month, a conference held between the Nuer and Murle tribes in the village of Burmath outside Akobo discussed the possible return of some of the children, including three who were abducted on Jan. 17. "We tell the chiefs that this is having negative consequences and that they need to stop this and live peacefully," said Ruei Hoth, one of the conference organizers. As desperation among South Sudanese continues, however, people are skeptical that the abduction and sale of children will end. "I don't think abductions will stop," said Tut Banguot, an aid worker in Akobo. "People have no resources and no salaries, they aren't working and so they get children and trade them for commodities."